Long Islanders flocked to the 1964 World's Fair, due largely to the proximity, the inclusion of a Long Island exhibit, and the resurgence of a special line of the Long Island Railroad that took travelers directly to the fair, a mode of transportation for visitors made popular in 1939. The 1964 World's Fair Committee estimated that 55% of visitors lived within 60 miles of the fairgrounds. The Newsday predicted in the April 20th, 1964 issue that Long Island would generate $34,000,000 from visitors to the fair. The area of Flushing Meadows, Queens, became increasingly embedded in Long Island and New York history in the 1960s, with the creation of the New York Mets professional baseball team. Their home field, Shea Stadium, was built in 1964, the same year the fair opened to the public, and only a stone’s throw away from the fairgrounds proper. The ballpark was also serviced by the same Long Island Railroad and subway station as the fair, which today is known as Mets/Willets Point on the 7 line. 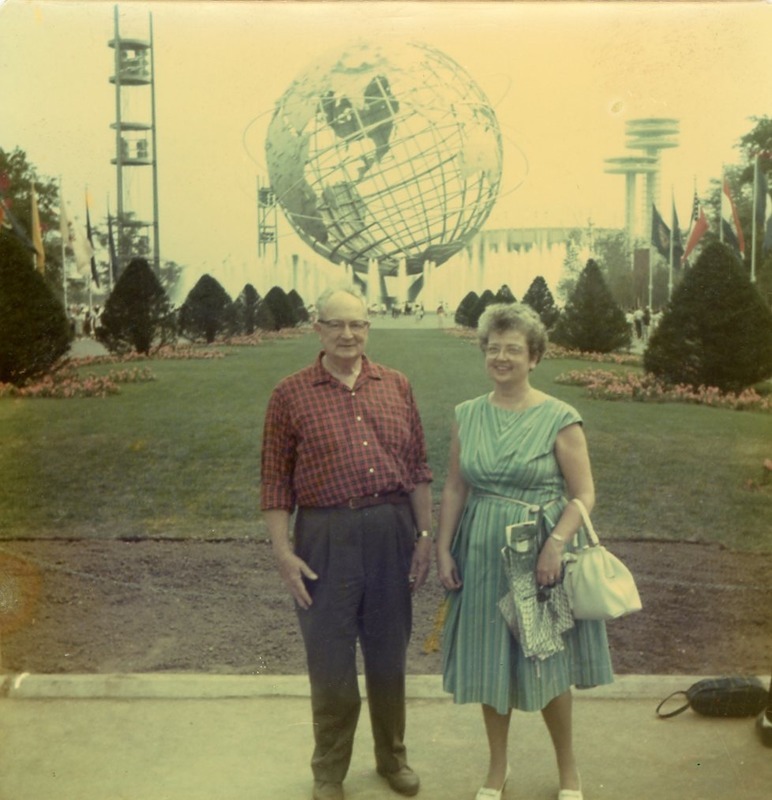 Barbara Kingsley, shown here with a male friend in front of the Unisphere, was one Long Islander who visited the Fair in this unique and memorable time for the city and Island's history. After attending the Women's College of Middlebury in Vermont, she settled in Port Washington on the north shore of Long Island. She is a prime example of New York area residents for whom the fair remains a touchstone of their life. They attended the optimistic fair before the turbulent years of the Vietnam War and the Civil Rights Movement. For them, the fair was both a nostalgic memory and a glimmer of hope for the future. The New York World's Fairs: The "World of Tomorrow" Celebrated Today. Forest Hills-Kew Gardens Post, "Michael Radoslovich A Designer of the Fair"
"108 World's Fair Recipes from Borden's!" "The Fair: Four Months to Go"
"Our Fair City: a map guide to New York City prepared for visitors to the 1964-65 World's Fair as a service of the Chase Manhattan Bank"